Global optimization is a branch of applied mathematics and numerical analysis that deals with the task of finding the absolutely best set of admissible conditions to satisfy certain criteria / objective function(s), formulated in mathematical terms. Global optimization includes nonlinear, stochastic and combinatorial programming, multiobjective programming, control, games, geometry, approximation, algorithms for parallel architectures and so on. Due to its wide usage and applications, it has gained the attention of researchers and practitioners from a plethora of scientific domains. Typical practical examples of global optimization applications include: Traveling salesman problem and electrical circuit design (minimize the path length); safety engineering (building and mechanical structures); mathematical problems (Kepler conjecture); Protein structure prediction (minimize the energy function) etc. Global Optimization algorithms may be categorized into several types: Deterministic (example: branch and bound methods), Stochastic optimization (example: simulated annealing). Heuristics and meta-heuristics (example: evolutionary algorithms) etc. Recently there has been a growing interest in combining global and local search strategies to solve more complicated optimization problems. 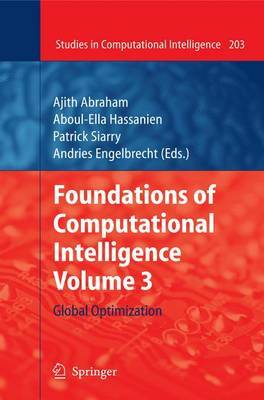 This edited volume comprises 17 chapters, including several overview Chapters, which provides an up-to-date and state-of-the art research covering the theory and algorithms of global optimization. Besides research articles and expository papers on theory and algorithms of global optimization, papers on numerical experiments and on real world applications were also encouraged. The book is divided into 2 main parts.